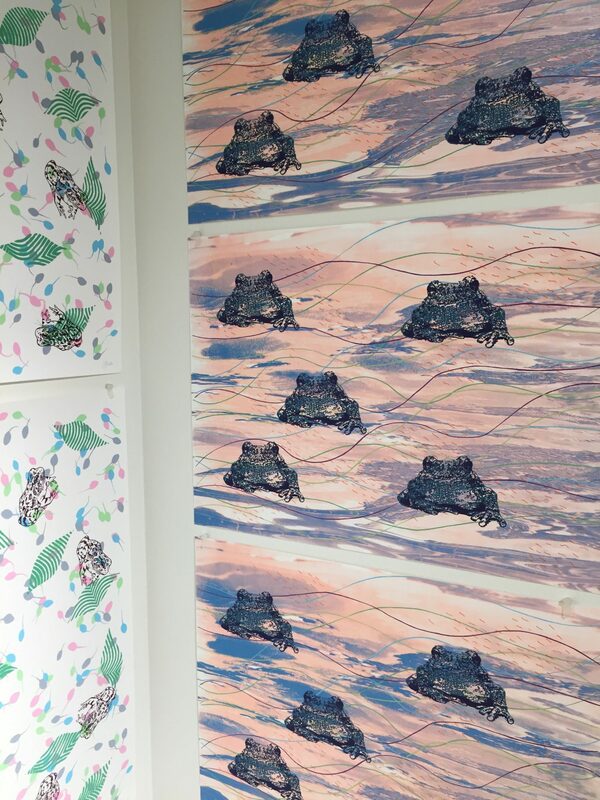 Jenny held a solo art show, The Ribbit Exhibit, at AS220 in Providence, RI from October 6th to 27th, 2018. Urbanites often picture frogs as living way out in the country or hopping through the pages of childhood storybooks. We forget that these delicate, yet tough, little creatures also dwell in the city as our neighbors. I live off a car-dominated stretch of North Main Street, yet two thriving frog communities exist just minutes from my house in the North Burial Ground where I go jogging. This cemetery has a large pond that’s home to a bunch of Bullfrogs, and a human-made drainage hollow that spontaneously transformed into a breeding ground for frogs and toads. After life-giving spring rains fill up the drainage hollow, Tree Frogs climb down from trees and Fowler’s Toads emerge from their hillside burrows to fill the night air with their strange calls and attract a mate. Frogs rely on a supply of clean, abundant water for life, and so do we, but we often forget this vital fact. Nature tries to remind us of this through frogs’ sensitivity to pollution, making them our little green teachers.